Our sales tax is 11.5%, and sometimes we include that in the price as a bargaining device. My problem is that I do not know how to reflect this in my loyverse system. 1) If I choose the "tax included" toggle, the $.10 tax does not show on the receipt. 2) If I give an 11.5% discount and then charge the 11.5% tax, it gives me: $1.00-$.12 (discount) + $.10 (tax) = $.98 (total). Which I understand is because the discount is being figured on $1.00, while the tax is being figured on the $.88. The tax amount also shows on the receipt for taxes "included in the price". 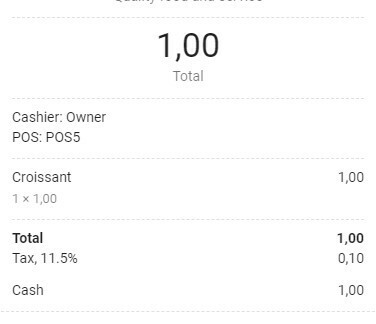 As you can see below the total it shows the tax amount. It will appear after you charge the ticket.